Battlecry: Restore 4 Health to your hero. If she threatens to "moon" you, it's not what you think. Shroom Brewer has a better effect for only 4 mana, so yeah, this card should be 5 at most. Blizzard, this card needs buff. Antique Healbot: 2.5 mana body, 2.5 mana for it's effect to restore 8 health to your hero. Making it's heal cheaper than Healing Touch, but only targetable to your hero. Still, it's a minion that can be targeted by Shadowstep and Gang Up. Antique Healbot has a lot of value. 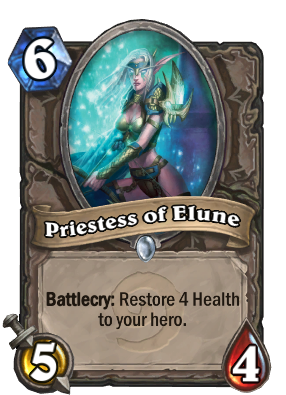 Priestess of Elune: 4 mana body, then if you compare it to Holy Light, this card's effect loses value. If it restored at least 6 health, which would be nothing absurd, it could actually be a potential replacement for Antique Healbot. A 5 mana 4/4 or even 3/4 that restores 6 health to your hero would be decent enough. But on turn 6 the heal + body is meaningless. 5/4 body will get cleared half the time, 4 heal isn't big enough, and costing 6 lowers the value of Shadowstep and Gang Up. If you look at Earthen Ring Farseer, a 2.5 mana body + 3 healing to a chosen character, Priestess of Elune is way worse. A potential buff to this card at least in the amount healed could make it much more viable and a possible (not as good) replacement for Antique Healbot for the upcoming meta, but as it stands this card is just too bad. Quite accurate analysis, and still valid today, I guess? At least, if the lack of newer comments is any indicator. Would like to add just this: "... with the possible exception of Arena". Seeing it's picked 1 time out of 3, presumably due to the scarcity of neutral healing? This card should be buffed to 5/5.